When we started the school term, we had just finished a new Prusa Mendel. After the students saw the Prusa, it seemed that everyone wanted to make one. As part of our RepRap breeding program, I set a goal of 10 Mendels over the course of a ten-week school term (seemed like one a week would be reasonable based on last spring term’s success). However, we ran into some electrical / control issues in debugging our first Prusa and time in the term kept ticking, ticking, ticking into the future. 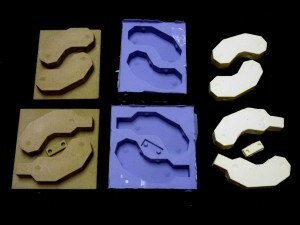 A year ago, I had thought about creating a set of molds to cast the plastic parts for a Classic Mendel. I concluded that there were too many parts and consequently too many molds (which would exhaust our budget for the RepRap Breeding project). The Prusa Mendel, however, has way fewer parts. Fewer enough to try the experiment. I took all last week outside of class to redesign Prusa parts for mold production. Most of the parts required only minor modifications, but several parts, such as the X-Carriage assembly, required redesign. All modified parts were placed on mold plates to allow for the production of silicon RTV molds. Makers will have to have a drill press available, as all holes will need to be drilled (their locations are clearly marked). As soon as each mold plate was printed on one of our 3D powder printers, two students (Scott Tandoi and Travis Nicholes) worked to make the molds. They also started to produce molded parts for their own Mendels. I came into the lab one morning last week and there was a Prusa frame completed to the point of mounting Y-motors and Y-Carriage. Our first Clonedel. Much lab excitement. We are quite sure that we can produce ALL of the plastic parts for a complete Prusa in under 30 minutes. We consider these molds to be in alpha status. We are still checking things out. Once we are good to go, we expect to release our working STL files of the mold plates to the community at large (hopefully, within a week). The STL form files are now up see the following article. I love your design changes for casting. could you upload the design files for your changes somewhere? preferably as a branch off the Prusa Github? Neil, Our intent is to make all the files available. We are open to suggestions. Prehaps thing-iverse? However Im still not fan of molded parts 🙁 I think it reduces the drive which printing of parts gives to community. Josef, We completely understand the mission of RepRap. We have known Adrian for over 15+ years. The idea of RepRap is amazing! The community’s mods and your mods in specific have provided for a simpler Mendel. We have a slightly different mission than RepRap. We would like to get as many Mendels into our students hands as possible. It is about time to make. Our students REALLY get the idea of RP but they are not very patient sometimes. Thing is, that selling parts kinda supports the further development. Someone sells parts makes some money on that and he can invest them back. Josef, people will sell parts (the money will still support what it supports). One of my students makes nice money on selling parts on Ebay. The market will adjust and time will march on. Adrian started this socialistic experiment and everyone is open to play. The distributed design aspect will also continue. Perhaps people will even start selling molds on Ebay too (for $50 a set). We know someone is working on electronics which are at least $100 less than current street price. Since, I’ve been watching things have not slowed down. According to Erik D., we are still in exponential growth (I see it the same way). We are a long way from a RepRap in every house! Amazing work! Will you be posting to this blog once the parts are available for purchase? As you can tell I’m a bit anxious.. :Op Again, very cool! Marco, We won’t be selling anything soon but I’m sure someone will make molds and start selling parts. Last night on the #reprap IRC channel, someone was talking about selling molds. the comments are what are really interesting… are molds a step backward or forwards? it may be hard to say. universities themselves are a kind of weird socialist/capitalist system (supported by gov, corporate interests, and their own structure) … sometimes I wonder if a design needs to have certain covenant rules added to them. otherwise [insert any large corporate entity here] could mass produce and open source design and take over by just throwing capitol at it. it may be good for getting a printer in everyone home but bad for small business and individuals. it’ll probably sort itself out, but interesting non-the-less. we’ll probably see a large entrenched company jump on board soon. its just all to tempting for them to not to with it being the future of things and all. “we live in interesting times…”. I think molds will do far more good than harm. For every user that slacks off on developing his reprap due to lack of financial incentive, there is the potential for far more new users in the gene pool due to the reduced cost of entry. This is especially true of the college scene where large groups can get up and running in far less time than if they were to try to print parts locally. In the absence of cheap/quick parts, groups like this one might not even get started. It’s a win for reprap overall. Bryan, you get it! We agree! What are you using for casting material, and about what would the materials cost be per Prusa set? different properties, then we will adjust. The Wade’s gears might be an issue we’ll just need to see. Also, color is available including neon and UV glow! Also there is already a RepRap loaner program. Imagine a reprap mold loaner program. Large groups up and running in quick succession using the same set of molds! “hing is, that selling parts kinda supports the further development. Someone sells parts makes some money on that and he can invest them back. I think people will just have to move on to printing experimental additions rather then basic parts. This also has the added benefit of rewarding innovation rather then through put. To whine that an advancement in manufacturing “will take the price down even more and it will slow down the development.” is a bunch of crap. That’s talking like a Communist. *Competition* is what advances development. This has been proven time and time again. prusajr, you yourself benefited by producing a superior product to the original Mendel. Start running, you have some catching up to do. In response to 22) can you recommend any materials for mould and for casting? I’m in the UK, so I’ll have to look for different brands anyway, but it would be nice to have a starting point that I don’t go totally into the wrong direction with too soft or too brittle materials. For polyurethane, we are using either Smooth-Cast 300/305 or 325/326. It is again a 1:1 mix ratio polyurethane. Over the last few years the polymer industry has been working very hard on producing products that are 1:1 mix ratios by volume (because it helps people be successful with their products). This is a comment taken from the Hack-A-Day post on Clonedels and has information on European polymer brands. I have been testing a 3-D printer at my work last week. Ours is like a CNC machine that writes its own programs based on drawings done in AutoDesk Inventor. That one prints in plastic. Architectural Drafting has one that prints things out of ceramic. Not quite sure how that one works though. It’s probably a silly question, but what is the design behind the bushings? Are they a variation of the felt bushings, and are there any photos or documentation how they’re used? I see… I didn’t find a direct match in the UK, so I’ll try something else. Jens, strangely, we prefer this bushing for the 8 mm smooth rod. Basically, any nylon bushing with an 8 mm inside diameter should work. ganter, I was going to try a bunch of spacers with a bigger outer diameter and a replacement holder. What do you think about cutting the bushings from nylon bar and drilling a hole? bushing to the clonedel parts.